Breathtakingly beautiful....would make a fantastic card ! Yes, breathtaking! That's the word! Did you loan the spider some of your yarn? What an amazing photo. That can't be Charlotte in that weather? Wow. That is a stunning picture. What a great photo! It sure has been chilly here in the PNW, hasn't it? i just sucked in a bunch of air.. ohhing over your photo. wow. what knitters they are! I've never ever seen that before! 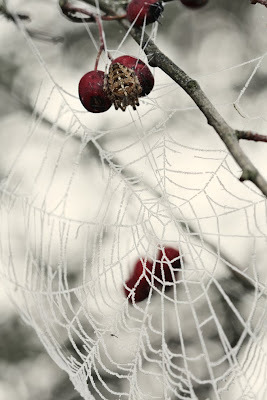 The cold little spider, maybe looking at all that beauty warmed him up. It did me!